Secretary-General Ban Ki-moon on his visit to the Socialist Republic of Viet Nam. In a year of critical efforts against climate change and growing global security challenges, Viet Nam's strong commitment to sustainable development and international peace have made it a “natural” partner of the United Nations, Secretary-General Ban Ki-moon said today. Following his meeting with Vietnamese President Trương Tấn Sang yesterday, the Secretary-General also wrapped up his visit to the country by delivering remarks to Viet Nam's Peacekeeping Centre, Diplomatic Academy, and National Assembly in an effort to solidify the bond between Viet Nam and the United Nations, especially in a key year for global efforts against climate change and amid the Organization's post-2015 development agenda roll-out. In his remarks, the Secretary-General spotlighted Viet Nam's particular focus on the need for “effective global action on climate change,” as he recalled the country's leadership on the Millennium Development Goals and voiced his hope for its “constructive engagement” at the upcoming Climate Change Conference in Paris in December. The theme of 2015 as a year for global action on climate and sustainability issues was also a highlight of Mr. Ban's address to the Diplomatic Academy of Viet Nam – a “prestigious” institution providing in-depth training, strategic research and forecasts on a wide range of pressing regional and global issues to Viet Nam's diplomatic corps. “There can be no peace without development , no development without peace, and sustainable peace and development are not possible without respect for fundamental human rights,” the Secretary-General affirmed as he reminded those gathered that “these three inter-connected pillars” have provided the basis for the UN's response to a host of contemporary challenges. A slate of upcoming UN conferences this year –on financing for development in July, and on climate change in December, as well as a summit-level meeting in New York this coming September – will seek to tackle the linked challenges of sustainable development and the threat of climate change. Mr. Ban reiterated, however, that the growing security challenges around the world and in areas of simmering tensions where UN peacekeeping missions are based posed an equal menace to global prosperity. “All of you are proud representatives of your country on the global stage,” he concluded. The Secretary-General is set to depart Viet Nam today and is scheduled to travel to Ireland tomorrow where he will receive the Tipperary International Peace Award and meet with the country's leadership and a cross section of Irish civil society. 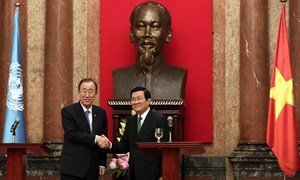 Secretary-General Ban Ki-moon today began a two-day visit to Viet Nam and commended President Trương Tấn Sang for the “increasingly important role” his country is playing at the United Nations, including his efforts to combat climate change and in helping shape a new development agenda.